This is a very good-looking ski. 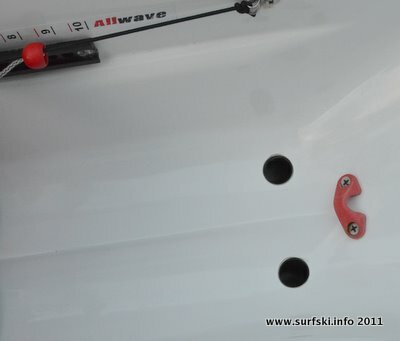 The boat that I paddled had been made in Italy at the Allwave factory there and, judging by the seams, they have build techniques that are more precise than most manufacturers. 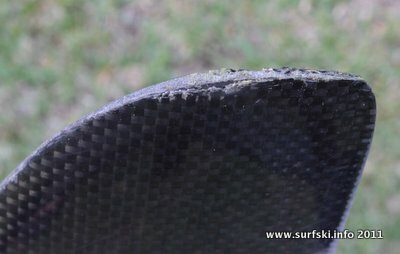 Every other ski that I’ve ever seen has a thick layer of resin over the seam – which disguises any imperfections in the mating of the deck with the hull. Not the CX. The fittings too are precise and beautifully engineered. Apart from their experience with outrigger canoes, the company also has long experience of building yachts, and this is evident in controls that adjust not only the footplate but also the angle of the rudder pedals. The tiller bar too is a beautiful machined stainless steel part – a far cry from the roughly stamped, bent and filed apologies for a bar that I’ve seen in some other skis! A line with a plastic handle is placed conveniently near your right hand. Pull the handle and the footplate locks are released. The first time I paddled the ski I set up the footplate too short. By pulling the handle and pushing the footplate with my heels, I was able to reset the leg length in seconds. The footplate is longer than other skis I’ve paddled, leaving you to steer with your toes. This took a little time to get used to, but given the lightness of the steering (as a result of the balanced rudder) I found that I enjoyed being able to push with my whole foot on the plate. The rudder lines, after passing through the rudder pedals, are combined to a single rope running through a cleat mounted on the front bulkhead of the cockpit. Again – this is very easy to adjust: pull the line tighter to tilt the pedals back; looser to tilt them forward. Some of the folks who have seen the boat questioned whether the pedal angle adjustment was really necessary. “Won’t that slip eventually?” was one comment. All I can say is that in the month that I had the boat, it didn’t slip at all. Footplate and pedal angle controls - well engineered but too fiddly? I found the cockpit very comfortable; one of the more comfortable skis I’ve tried. I’m one of the few people who can’t paddle the Epic skis without a bum pad (my coccyx rubs raw) and I find Fenns most comfortable. So if you’re compatible with a Fenn bucket, you’ll fit this one too. One caveat though: this is a narrow ski and several of the folks who tried it found it a very snug fit. Honcho were the first (that I saw) to install a “get me home” emergency steering system on a ski. 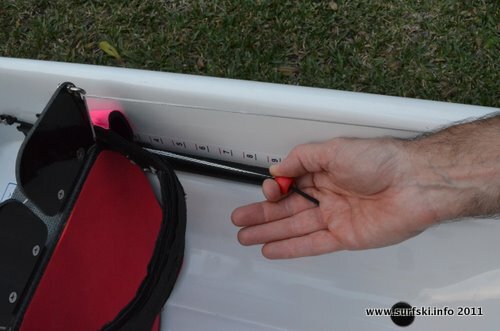 The idea behind this is that if you break a rudder line, you can hook a strong elastic cord to the tiller bar on the same side as the unbroken line. The rudder is now tensioned and automatically steers toward the side of the broken line – but you can steer with the pedal whose line is still attached. 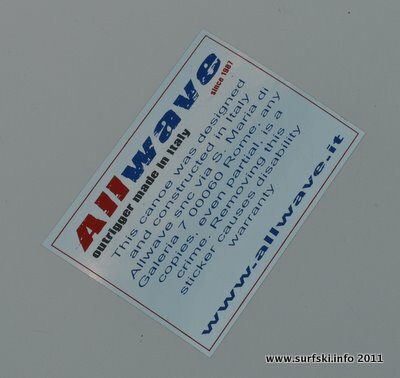 Allwave have a superb implementation of this idea; I tested it and it works perfectly. 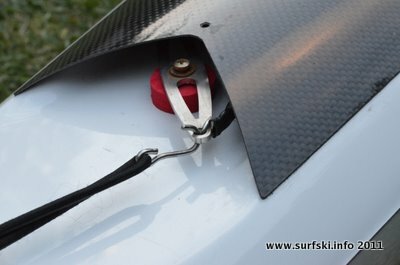 With the bungi attached, the rudder has a strong enough tendency to turn to one side, that the ski is controllable even when moving fast downwind. When not in use, the bungi is hooked to the cover that extends over the tiller bar. Very neat. The left hand rudder line has snapped; the emergency steering system is now hooked to the right hand end of the tiller bar. Steering is now possible using the right hand rudder pedal only. This impressed me sufficiently that I’m going to modify my skis to have a similar system. 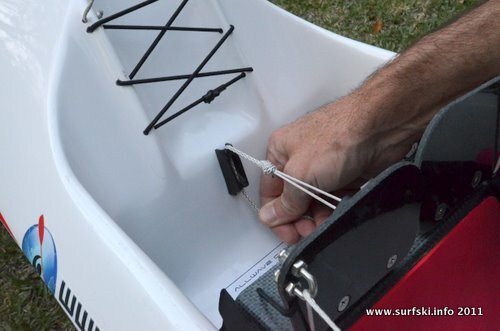 I’ve seen many paddlers break rudder lines – and at least five I can remember happened in big downwind conditions with extreme discomfort resulting. Ok, so enough of the wonderful engineering of the ski. What’s it like to paddle? We did a number of flat-water sprints inside Hout Bay Harbor. My impression is that the ski is no slower than the other high-end skis. 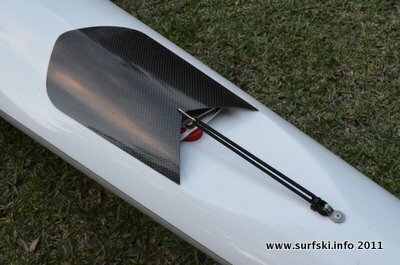 I also had an elite paddler try it in flat conditions with his training group and he too said that he was impressed with the way the boat performed. There’s an 88 ton catamaran tourist boat that operates out of Hout Bay Harbor. Every hour she sets off towards Duiker (aka Seal) Island about 4km away, leaving a superb wake behind her. When the weather’s not suitable for downwind paddling, we like to ride Nauticat’s wake, picking it up at the harbor mouth and staying on it until the boat reaches the island. We tool about in the channel until the tourists have had their fill of the Seals, then we hop back onto her wake and ride it back to the harbor. But it’s also a great test of the tendency of a ski to broach. The waves streaming out behind the boat are short and steep, and if a ski is prone to broaching, it’s almost impossible to handle. You feel the ski slewing out of control; you veer sideways and by the time you’ve turned the ski back on course you’re one wave further back. 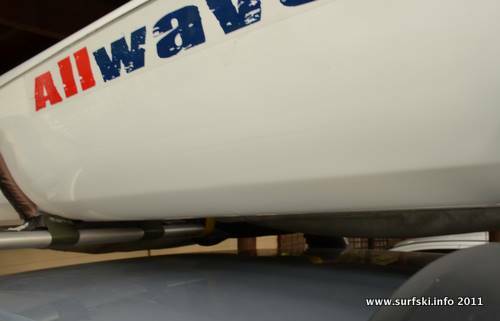 The Allwave CX handles the Nauticat Test with aplomb – it was easy to stay on the wave and I could steer backwards and forwards moving out and then back in along the wave. Phenomenal handling that bode well for downwind paddling. Having ridden Nauticat’s wake back from the island, we met a friend at the entrance to the harbor and set off again back across the bay. A light southeaster was blowing and the water, as always in Hout Bay, was choppy. Heading directly into the wind, I found the ski a blast; I was able to put my head down and drop my companions at will. At the base of Chapman’s Peak we turned around to set off downwind back to the harbor. Now however I found that I felt quite unstable in the ski and, instead picking up the runs in the slop as normal, I battled to find a rhythm and my buddies dropped me. I’m still not sure quite why I found the ski difficult to handle in these conditions – but it happened again during a messy Millers Run, described below. I did several Millers Runs in the ski – two classic runs in southeasters, and a Reverse Millers in a northwester. Conditions: 2-3ft waves, 15-20kt Southeaster (20-22kt registering at the half-way point, Roman Rock). I found the ski quite twitchy, but found that the faster I went, the more secure I felt. The ski accelerated very easily onto the runs and was exceptionally easy to maneuver. With never a hint of a broach, I was touching the rudder to turn the ski to chase the next dip. Although the nose of the ski seems to be quite low in volume, it didn’t seem to nosedive and although some water came in over the cockpit sides, it drained very quickly through the bullet-equipped bailers. Approaching Fish Hoek Bay, I hooked the paddle on a wave and in the blink of an eye I flipped into the water. I was back in the ski and paddling inside 30 seconds, which is pretty fast for me. The ski is easy to remount! And I beat my buddies handily in spite of falling in. So far so good. When the northwester blows, we go with it, offshore from Fish Hoek to Millers Point. When the wind is strong, the runs start at the mouth of the bay, but usually they only start half way to the lighthouse, growing in size steadily. In contrast to the Millers Run the waves are usually regular and clean – purely wind generated chop. What fascinated me was the way I could paddle the runs diagonally – 20-30 degrees either direction, again, without a hint of a broach. In these conditions, the ski is a joy to paddle. Conditions: 3-4ft waves, 25kt SE. The first 800m of the run is often quite challenging, since you’re paddling diagonally out into the wind and swell to get to Bakoven Rock – which marks the beginning of the downwind section to Fish Hoek. In the side-wind and waves I found the ski twitchier than my regular steed (the Fenn Mako Elite). I’d like to try the ski with a slightly de-tuned rudder. 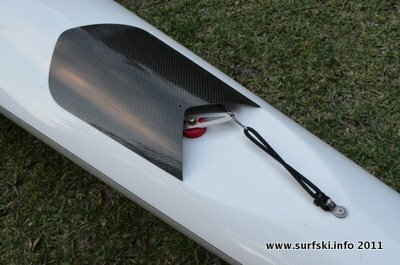 The rudder is very effective and well balanced and perhaps a rudder with less bite would improve the stability. The run itself went very well – the ski’s maneuverability was again striking. On balance I’ll gladly accept the dampness caused by the low cockpit rails - given how easy the ski is to remount. My final run in the ski wasn’t so happy. Once again, the waves were small but were ricocheting in all directions – and I couldn’t get settled in the boat. I found it difficult to make ground against my buddies and ended up taking a swim halfway between the lighthouse and Fish Hoek beach. I took a total of three swims while paddling the ski and apart from confirming that it’s an easy remount(!) I suspect that the secondary stability may be a little less than the Fenn Mako Elite – making it a slightly less forgiving ski. I like: the "don't copy" warning notice! The Aesthetics – Italians sure know how to design style into a boat! I found the ski a little more twitchy than my Mako Elite. I didn’t perform well going downwind in small confused seas. A couple of the folks who tried it said they found the bucket too narrow. The name… Surely there’s a sexier/more exotic/more elegant name out there than “Allwave CX”! The ski deserves it! This is one of the most exciting new skis I’ve ever paddled. 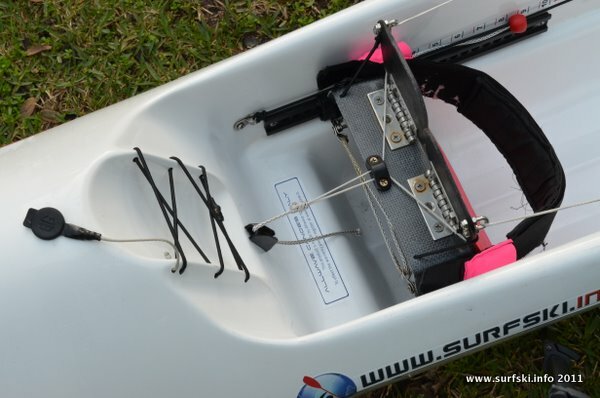 It’s clearly for advanced paddlers – but it seems fast and catches runs with alacrity. I’d like to see a version slightly wider (and less tippy). In my opinion, this ski ranks up there with the rest of the “elite” level skis… If you can get your hands on one, definitely include it in your list of skis to try out. 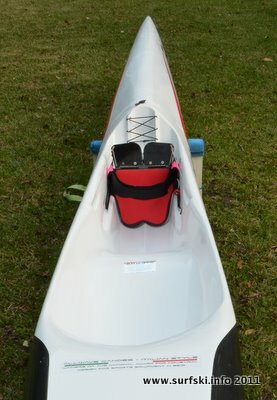 In particular women and men of lighter build may find this a particularly agreeable ski – it’s light, has low volume and a narrow cockpit.